Jupiter dominates the late evening sky, an unmistakeable object riding to the south in the constellation of Virgo not too far above its chief star Spica. Observations of the largest planet in our solar system are always rewarding, even with a small telescope. Look for the dark banding across the disk, the Galilean moons; the configuration of which alters each night, discernable even over the course of several hours, and if you posses a slightly larger telescope, look for the great red spot. This oval feature is an Earth sized hurricane type storm, present on Jupiter for the last 400 years. Its appearance can change; sometimes looking paler and smaller (as in recent years), but always fascinating to look out for. Due to the quick rotation of Jupiter the GRS is not always facing our direction, so don’t be disappointed if you cannot spot it. 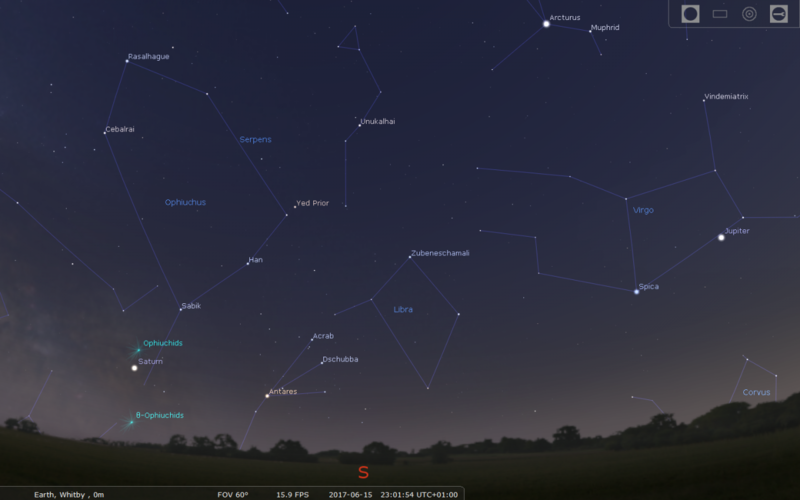 View from June 10-12th when it is visible around 11pm on the southern equatorial belt. 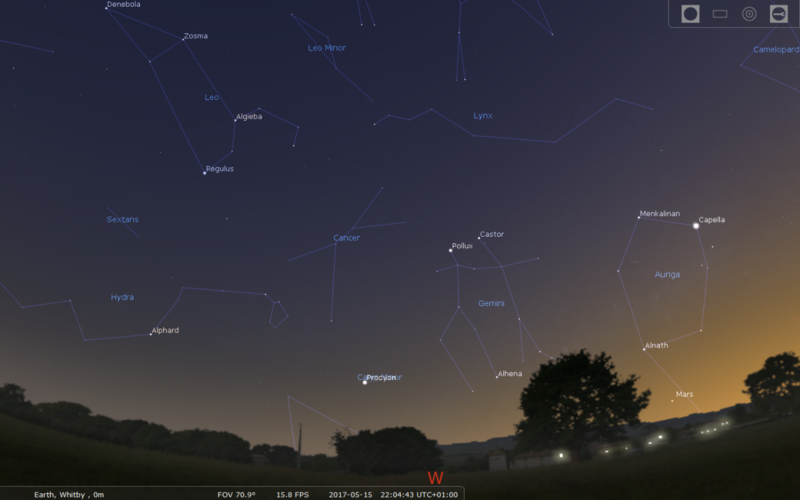 The Moon lies nearby Jupiter on the 3rd and 30th. 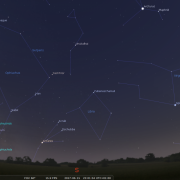 Jupiter may dominate the evening sky, it is however Saturn which takes the plaudits in June, coming to opposition on the 15th and therefore visible all night, admittedly an observing window barely amounting to 4hours at this time of year. 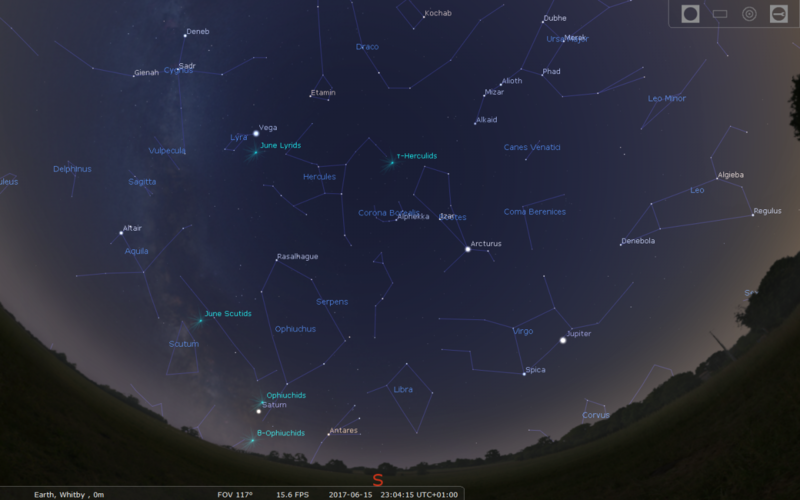 As twilight deepens look for Saturn low in the southeast residing in the constellation of Ophiuchus. A modest telescope will reveal the glorious ring system, which is orientated favourably at present; however the low altitude of Saturn does mean the observer is looking through more turbulent air close to the horizon. Patience at the eyepiece will ultimately be rewarded when steady seeing moments allow Saturn to snap into sharp and stunning focus. Look for the major gap in the rings, the Cassini division, and remember that the Cassini probe is still orbiting Saturn (until it dives into Saturn’s atmosphere in September) Careful observation will reveal a speck of light close by Saturn, this is Titan, Saturn’s major moon. 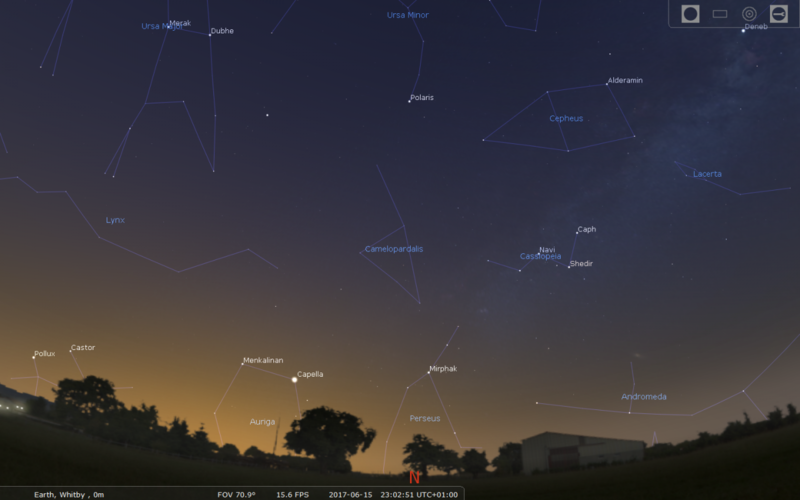 Our moon lies nearby in the sky on the 9th. 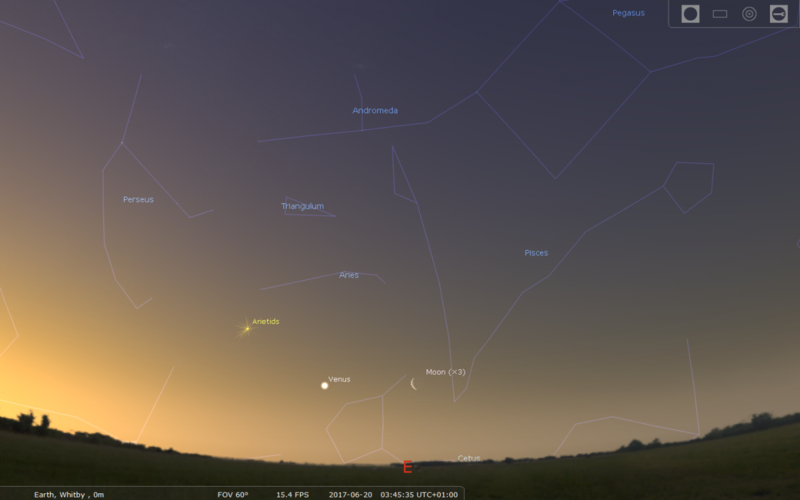 Finally, Venus may be located very low in the dawn twilight sky approximately 45 minutes before sunrise. 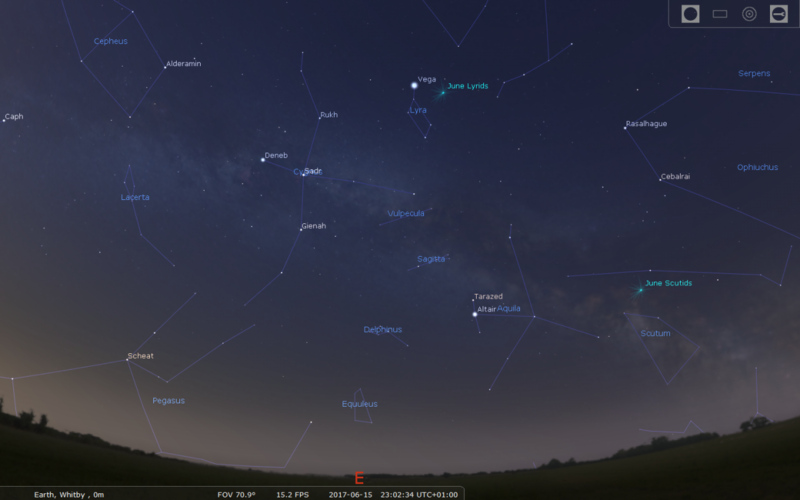 Look for a brilliant object just above the ESE horizon. The summer solstice in the northern hemisphere falls on June 21st, when the Sun reaches its greatest altitude in the sky on the ecliptic; the path it takes across the sky during a year. The word ‘solstice’ is derived from the Greek for ‘Sun’ and ‘stoppage’. From our perspective the Sun will cease gaining altitude in the sky and will soon retrace its steps, retreating southwards once again as the axial tilt of Earth begins to shift away from the direction of the Sun. During our summer when the northern hemisphere is inclined towards the Sun, it feels warmer due to the higher concentration of sunlight per unit area. Think of this as being like a spot light directed onto to the palm of your hand, your palm feels hotter under direct radiation, whereas when the light is tilted, the angle reduces the heat intensity. The actual intensity of solar radiation in June is equivalent to approximately 1.2KW of heat for each square metre, although I can recall many a June when the power switch was apparently turned off! 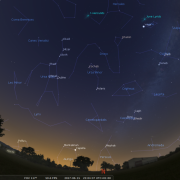 The position of the summer solstice currently stands on the Gemini-Taurus border but it wasn’t always so. Thousands of years ago it stood before the stars of Cancer in the northern hemisphere, but has subsequently shifted due of the effects of precession, Earth’s slow axial wobble due to the influence of the moon. From our latitude the Sun never gets overhead, reaching just 59 degrees above the southern horizon at midday on June 21st. From locations between 23.5 degrees north and 23.5 degrees south of the equator, the Sun can appear directly overhead, casting no shadows, which astronomers of antiquity duly noted. At that time the summer solstice position stood before the stars Cancer, and eventually the latitude of 23.5 degrees north became known as the tropic of Cancer. Similarly when the Sun reached its southern limit on the ecliptic (the winter solstice) 23.5 degrees south of the celestial equator, it stood before the stars of Capricorn, the origin of the tropic of Capricorn. Perhaps during our epoch more fitting names for the tropics would be the tropic of Gemini and the tropic of Sagittarius! Until next time, clear skies! 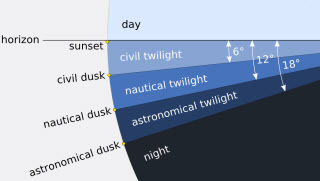 The deepest level of darkness, known as Astronomical twilight, is just one of three levels experienced, the others being Civil and Nautical twilight respectively. However as Earth orbits around the Sun, the duration and intensity of these twilight levels varies a phenomena most noticeable at higher latitudes. Using evening twilight as an example let me explain further. 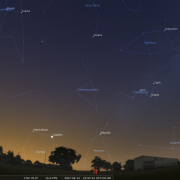 Immediately after sunset, Civil twilight exists until the Sun is approximately 6 degrees below the horizon. At this point normal daytime activities that require light cease to be possible and ‘lighting up’ time occurs. If skies are really clear an interesting phenomena occurs half an hour or so after sunset, opposite the position of sunset. Look for a hazy, darkish purple band just above the ESE horizon which appears to heap up, before being engulfed by deepening twilight. It is not mist but the shadow of Earth itself, being cast back into space! 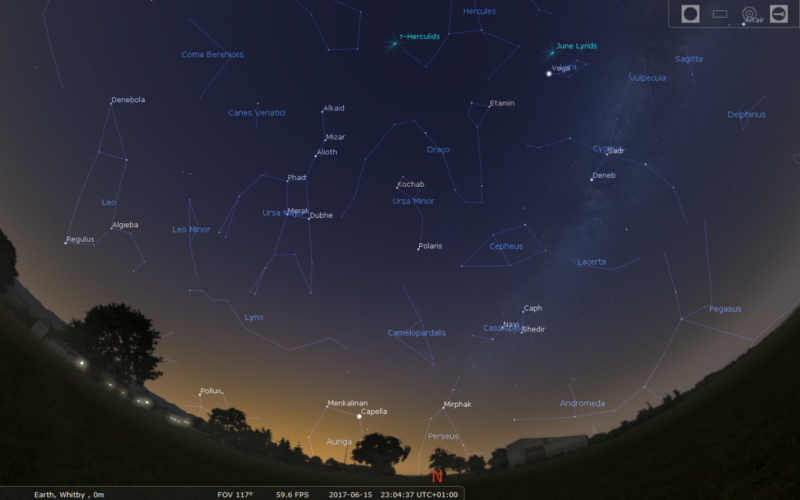 Finally, when the Sun drops approximately 18 degrees below the horizon (a hands span) Astronomical twilight commences and the remaining fainter stars become visible. Obviously the faintness of these depends on your local circumstances - it stands to reason someone observing from a dark rural site will see more stars than someone observing from a light polluted urban site. Then, with the approach of dawn the same lighting levels are experienced - only in reverse. During summer in the northern hemisphere we are inclined towards the Sun and twilight durations alter significantly. 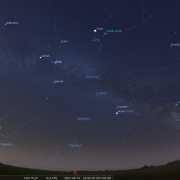 At our latitude, for 82 nights from late May until mid August, astronomical twilight is totally absent as the Suns journey beneath the horizon is so shallow it never actually reaches 18 degrees. 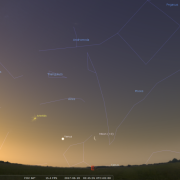 Matters become worse (for the astronomer) around the summer solstice when even nautical twilight levels barely exist, the Sun setting by a mere dozen degrees. Not surprising then that many astronomers ‘mothball’ their telescopes, waiting for darker skies to return. Some of us persevere; there is always the moon and a bright planet or two to observe. 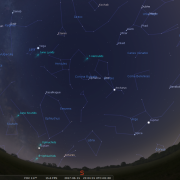 At least from northern England summer astronomy is just about possible, but as you travel further north nocturnal conditions grow ever lighter and only 13 degrees north of Whitby at latitude 67 degrees N (the Arctic Circle) twilight on any level is completely absent. From here for part of summer the Sun is visible above the horizon 24 hours a day. Only solar observers are completely happy for in the land of “midnight sun” star gazing is limited to just one, that is if it’s not cloudy! 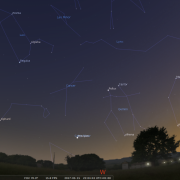 With bright twilight now persisting well into the night, observers of the sky should watch out for a particularly beautiful type of cloud formation seen only at this time of year. Known as Noctilucent cloud, these delicate formations appear above the northern horizon, long after sunset, often around midnight. Shining quite brightly, Noctilucent cloud is filamentary in structure, having a characteristic silvery-blue colour. It forms almost exclusively between latitudes 50 and 60 degrees north, high in the upper atmosphere: 50 miles up- five times higher than normal clouds. The cloud forms when water vapour condenses at the low temperatures that prevail at such altitudes onto particles suspended in the air. More frequent sightings of Noctilucent cloud over the last 40 years may indicate that these particles could be a result of industrial pollution, perhaps from increased air traffic, although the jury is still out on this.